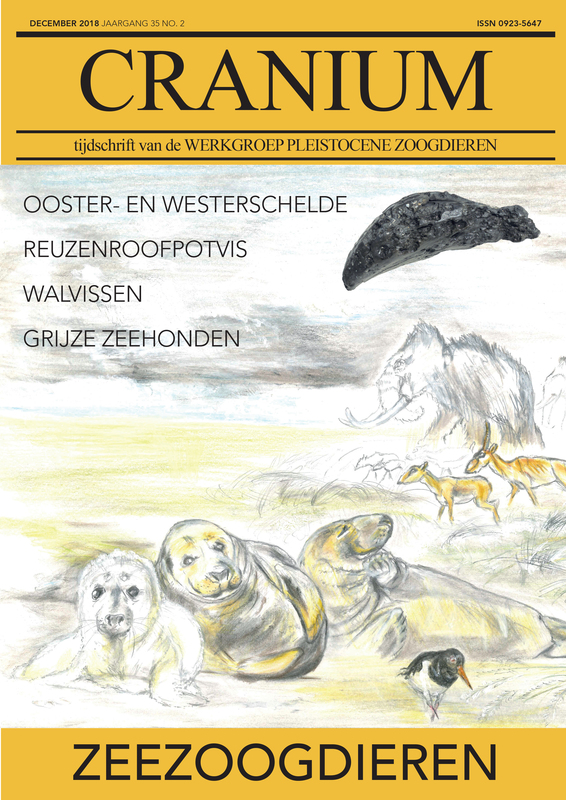 Cranium is a journal published by the Dutch Association for the Study of Pleistocene Mammals (WPZ). The magazine is published twice a year (in May and November) and aims to appeal and inform both the beginning and experienced (amateur) palaeontologists. The content varies from scientific research and background information, to new finds, museum and book reviews, and WPZ news items. An overview of past publications and the editorial board can be found on this website. Membership with the WPZ or a Cranium subscription is available at € 25 per year. Contributions or questions about Cranium can be sent to the editorial board at craniumredactie@pleistocenemammals.com. Below are the authors’ guidelines regarding the Procedure, Topics, Language & Usage, Style, Categories, Submission Requirements, and References. Cranium accepts manuscripts about all Pleistocene mammals from all continents, and will make exceptions every now and then for related topics (such as Pleistocene birds and fishes, or Pliocene fossils from the Netherlands). Priority however, is given to papers written in Dutch, by our members. When in doubt about the relevance for publication in our magazine, please contact us at craniumredactie@pleistocenemammals.com. The articles are primarily in Dutch with English abstracts and captions. Exceptions can be made for other languages, providing Dutch abstracts and captions. The editors can certainly help out with the Dutch translations. Non-Dutch manuscripts, mainly English, German or French, will in principle only be accepted from non-Dutch speaking authors. Again, exceptions can be made, depending on the case. The non-Dutch manuscripts are to be (co-)written, or checked, by a native speaker, before submission to Cranium. Every manuscript in every category has to carry the name of the author, but other than that the specifics slightly differ per category. Literature is without numbers, but by author in alphabetical order. Titles of magazines have to be written in full, no abbreviations, and in sentence case. Last name, Initial(s), Initial(s) Last name, Initial(s) Last name (year) Title. Title magazine, number, pages. Hooijer, D.A. (1950) Fossil evidence of Austromelanesian migrations in Malaya? Southwestern Journal of Anthropology 6, 416-422. Rabeder, G., M. Hofreiter, M. Stiller (2011) Chronological and systematic position of cave bear fauna from Ajdovska jama near Krško (Slovenia). Mitteilungen der Kommission für Quartärforschung, Österreichischen Akademie der Wissenschaften 20, 79-86. Last name, Initial(s), Initial(s), Last name (year) Title. Publisher, place. Mol, D., J. de Vos, R. Bakker, B. van Geel, J.H. Glimmerveen, J. van der Plicht, K. Post (2008) Kleine encyclopedie van het leven in het Pleistoceen: mammoeten, neushoorns en andere dieren van de Noordzeebodem. Veen Magazines, Diemen. Reumer J.W.F., J. de Vos (Eds. )(1999) Elephants have a snorkel! Papers in honour of Paul Y. Sondaar. Deinsea 7, Natuurhistorisch Museum Rotterdam. Last name, Initial(s), Initial(s), Last name (year) Title. in: Last name, Initial(s), Initial(s), Last name (Ed./Eds.) Title compilation, pages. Mol, D., K. Post, J.W.F. Reumer, J. de Vos, C. Laban (2003) Het Gat: Preliminary note on a Bavelian fauna from the North Sea with possible two mammoth species. in: Reumer, J.W.F., J. de Vos, D. Mol (Eds. ), Advances in Mammoth Research; Proceedings of the Second International Mammoth Conference, Rotterdam, 16-20 May 1999, DEINSEA 9, 253 – 266. Avoid website references as much as possible. Last name, Initial(s), Initial(s), Last name (year), Title article, website address (date of reference visit: dd-mm-yyyy). Anoniem (2017), Van der Lijn onderscheiding 2017 voor Remie Bakker, http://pleistocenemammals.com./van-der-lijnonderscheiding-2017-voor-remie-bakker/ (27-2-2017). When in doubt, please contact the editorial board or add a note with the submission.